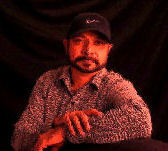 MUSIC COMPOSER: Oasis Thacker, also known as Ghanshyam Thakkar is exiraordinarily talented music composer. His compositions vary from pop, semi-classical, folk, his own style of NewMusic, Sugam Sangeet, Dandia Raas, Bhangra, and Indo-Western fusion. The songs in his albums ‘Aasopalav-ni Daale[આસોપાલવની ડાળે] and O Raaj-re[ઓ રાજ રે] will melt in your hearts. Some of them will compel you to dance. His songs have been sung by accomplished film playback singers, and folk singers like Kishore Manaraja, Nisha Upadhyay, Damayanti Bardai, Neha Mehta, Jayashree Bhojavia, and Devyani. After his success in Gujarati Albums, he is busy composing music for Bollywood (Hindi and Ghujarati), and Hollywood audiances. He is prepared to compose music for films, music albums, and other avenues that will allow him to express his creative talent. His albums are available in stores. His songs will soon be available to download on his official websites. He has recently released an instrumental music album for international audiance, ‘DewDrops on The Oasis’. In this album you can enjoy his own OasisMusic style. POETRY: Oasis Thacker [ઘનશ્યામ ઠક્કર]is an accomplished Gujarati poet, and has also written poems in Hindi and English. Gayanpith Award winner Shri Umashankar Joshi [શ્રી ઉમાશંકર જોશી] and Shri Labhshankar Thaker [શ્રી લાભશંકર ઠાકર] have written forewords for Ghanshyam Thakkar [ઘનશ્યામ ઠક્કર]’s poetry books ‘Bhuri Shahi-na Kuva Kanthe[ભૂરી શાહીના કૂવા કાંઠે]‘, and Jambudi Kshana-na Prashna Padare [જાંબૂડી ક્ષણના પ્રશ્ન પાદરે], praising him for his new and unique poetic excellence. He has been recognized by great poets like Shri Anil Joshi in his newspaper column. Ghanshyam became serious about writing poetry after he received encouragement and inspiration from Poet Shri Priyakant Maniyar in 1969. His poems have been published in top periodicals of literature, such as Kumar, Kavita, Kavilok, Navnit, Samarpan, Navnit-Samarpan, Parab, Kruti, Milap, Vishvamanav, Vaishakhi [કુમાર, કવિતા, કવિલોક, નવનીત, સમર્પણ, નવનીત_સમર્પણ, પરબ, ક્રુતિ, મિલાપ, વિશ્વમાનવ, વૈશાખી] etc. since 1970. MUSIC ARRANGER: Oasis has mastered his electronic synthesizer that creates natural sounding acoustical instruments, electronic sounds and amazing rhythms. He has created several new music instruments himself, that you hear in his albums. His orchestration is a symphony of feelings. INSTRUMENT PLAYER: He plays various instruments on his electronic synthesizer. Many of these instruments are created by Ghanshyam. LYRICIST: He writes beautiful lyrics in Hindi and Gujarati. Compared to his poetry, Oasis becomes totally different type of writer when he writes lyrics for music. The words blend with music, without losing elements of poetic glow; and easy to understand metaphors avoid unwarranted scholastic burden. RHYTHMIST: Oasis plays western drums set, bongo, congas and electronic drums. He pioneered use of drum-set in DandiaRaas, and in Tabla-based Hindi songs since 1977, that has now become a tradition. Like music, he also composes NewAge rhythms. RECORDIST: Oasis records music on his 48 track digital studio. ENGINEERING & MANAGEMENT: Oasis moved to USA in 1973 and began working at NASA as Electrical Design Engineer, while pursuing higher education. He worked as a Project Manager and Chief Electrical Engineer for Properties and Facilities department at American Airlines, for over 7 years, where he participated in development of new energy saving methods for 400Hz Aircraft Ground Power Systems. He managed several such projects worth millions of dollars at most of the US airports. Here he had opportunities to see USA, and some other parts of the world. He has also worked for private consulting engineering firms performing similar duties. EDUCATION & SCHOOL DAYS: Oasis has bachelor’s degree in electrical engineering from Gujarat University, India, and has attended Lamar University in Beaumont, Tx to take some post graduate courses useful for his occupation. He has also taken business courses at different colleges. He completed his elementary education in a small village in India. He attended Diwan-Ballubhai high school in Ahmedabad He was one of the highest-ranking students in SSC exam, with 78% grades. He completed his two years of Science education in St. Xavier’s College before entering engineering college. He received his post graduate education in USA. Education was only half of his school-work. He was always involved in extra-activities, that included literature, performing arts, music and leadership. He participated in interschool talent competition in Kheda District before he was allowed to attend the school….at the age of 4, and won a special prize. His poetry career began after he won prize in Intercollege Youth Festival of Gujarat University. Please click MEMORIES for more…..